This chowder recipe is from Sunday Soup: A Year’s Worth of Mouth-Watering, Easy-to-Make Recipes, a book Lisa’s mom got for us on a recent visit. We’ve already made two or three recipes, and all have been delicious. Salmon, potatoes, asparagus, what’s not to like? Heat the butter in a large dutch oven over medium heat. When hot, add in the potatoes; cook, stirring often, for 5 minutes. Add the onion and cook, stirring continuously, for 2 minutes. Add the garlic, decrease the heat for low, cover, and cook for another 2 minutes. Use a fork or the back of a wooden spoon to mash the potatoes. Add the chicken stock and kick the heat back up to medium, stirring well. Bring to a simmer and add the green onions and asparagus, keeping the tips aside. Cover, reduce the heat, and simmer until the asparagus is tender, about 3 minutes. 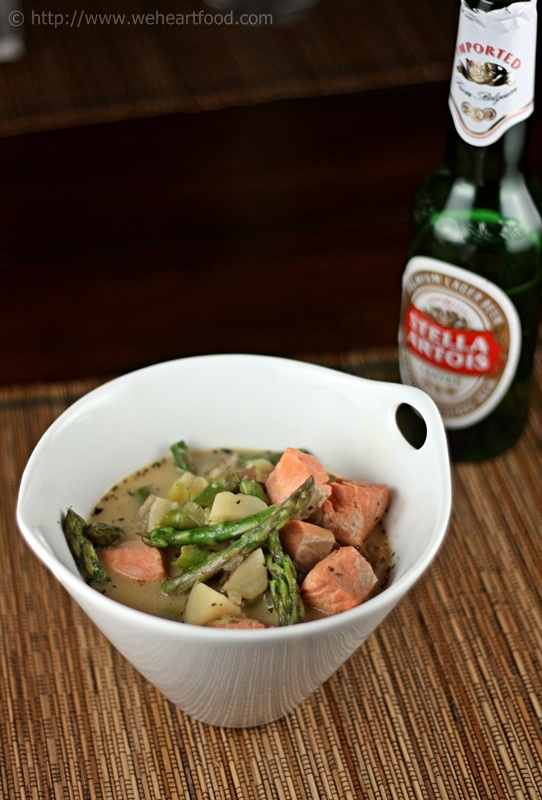 Stir in the half-and-half, reserved asparagus tips, and salmon. Turn off the heat and cover. Let sit for 4 minute or so until the salmon is cooked through. Season with salt and pepper. Serve and top with chopped dill.